I've been growing more interested in hot peppers and gardening over the last two years and have decided to get a little more serious about growing this year. I wanted to get a jump start on the season, but didn't quite know how to start. (Especially with lighting.) I asked for some guidance from the forum and received a lot of good input. Fast forwarding a few days, I ordered a 4 bulb T5 fixture and purchased a rack setup from Home Depot. 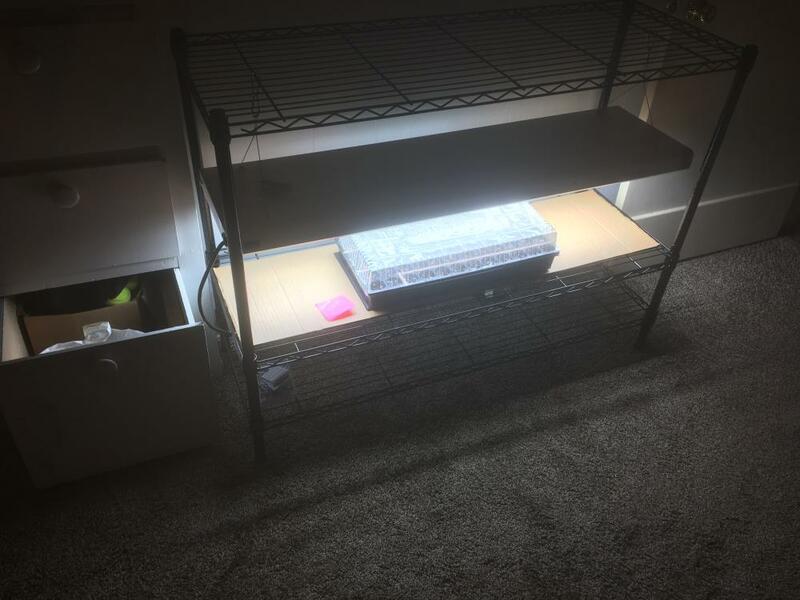 I also have a little Jiffy seedling starter setup and a cheapo heat mat from Amazon. 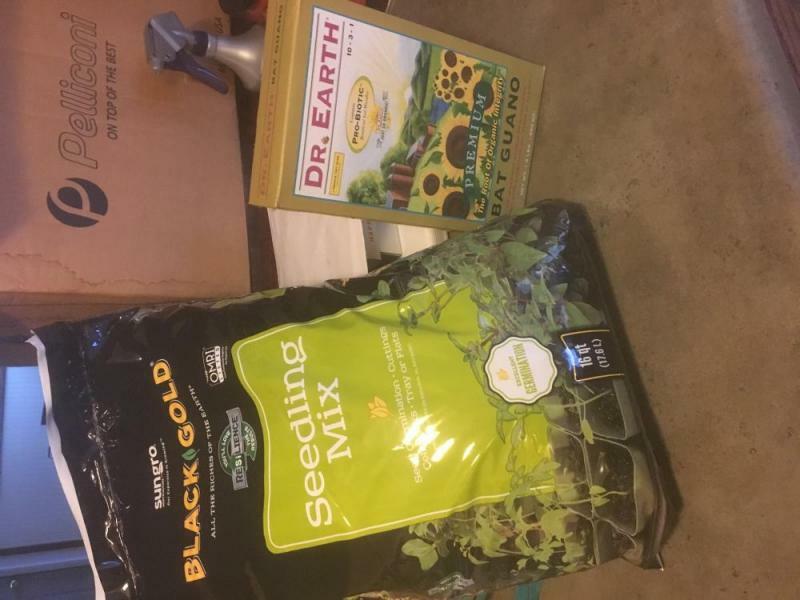 So to prepare for the coming year, I ordered some seeds from AJDrew. I purchased the following: Reapers, Butch T Scorpions, Red Savina Habaneros, and 7 Pot Douglahs (Chocolate). I'm debating growing the Thais again, if space allows. He did include some extras, so thanks AJDrew, I appreciate it. 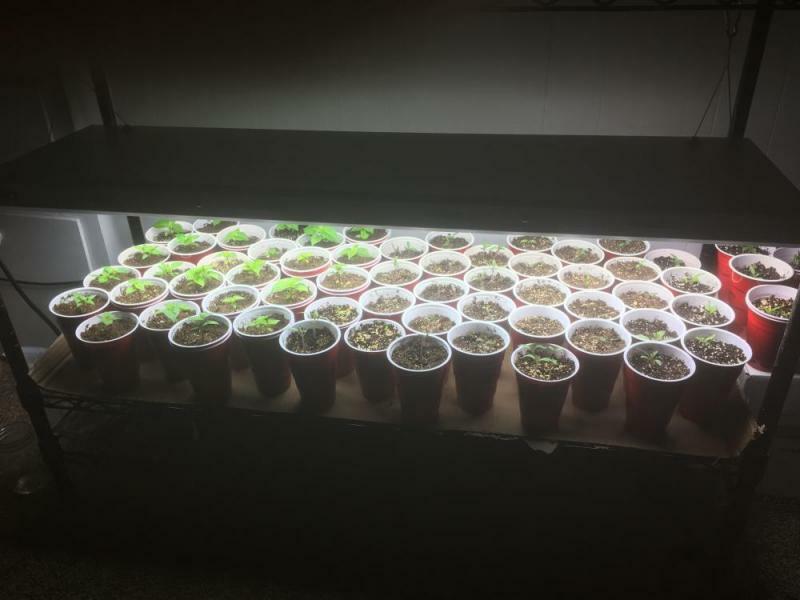 I soaked my seeds for 12 hours in lukewarm water and then planted them after they all sank to the bottoms of their containers. In total, I dropped about 80 seeds. It seems like a lot, but I have no idea how many will come up. This was on 2/2/2019. I'll keep this updated as things progress. 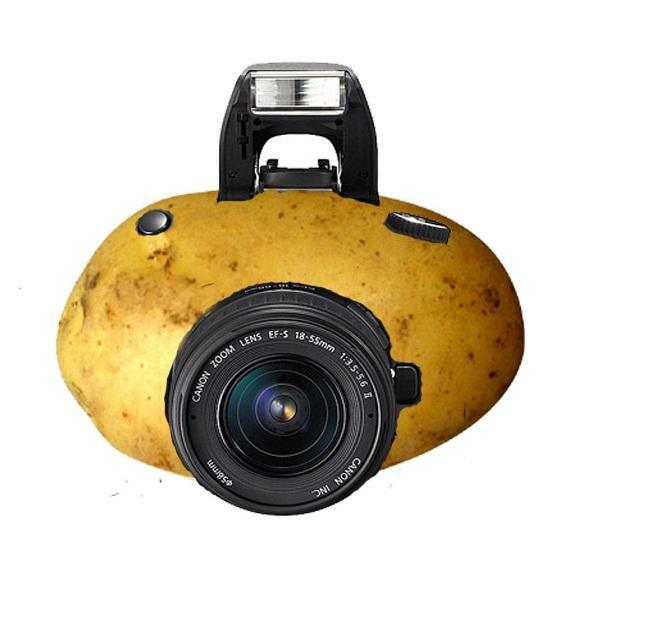 Enjoy the pictures from my potato-phone. We'll be putting up the rest of the shelf as we do more seedlings. I have had good results with AJ's seeds in the past, so I would expect that most of those 80 seeds will germinate for you. Good luck with your grow. 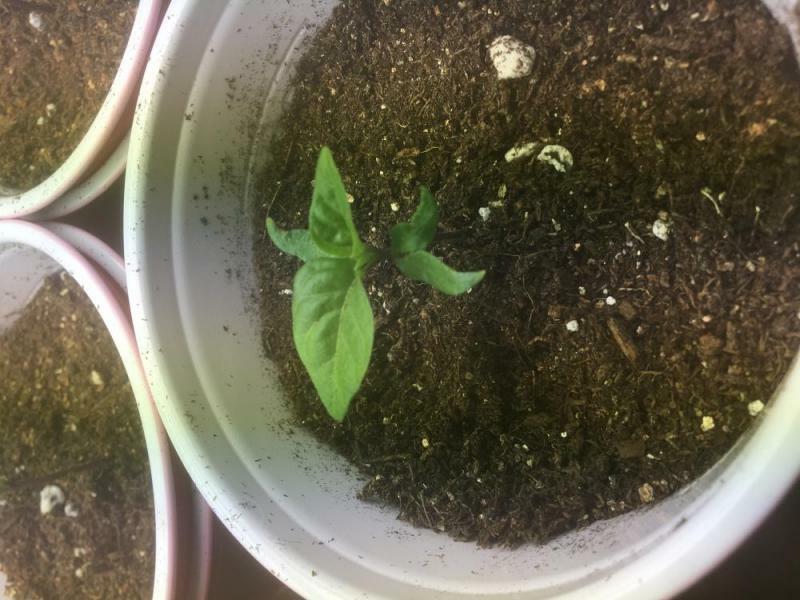 I had some white Bhut from his seed last year and they did really good. 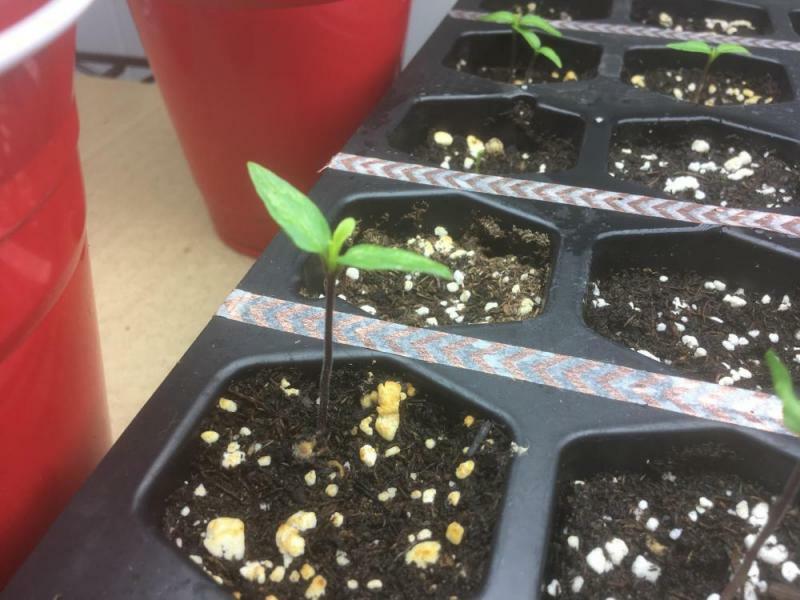 Good luck getting those new seedlings into the grow season! I've got six Reaper seedlings (if you can call them that) that are between 1/2" and 1". A few still have their seed casings on them. I'm a little disapointed as the others haven't come up yet in the same way, but it is still early. I had used a small spray bottle to mist the seedlings, but it's possible that I disturbed some of the soil, making it look like they were ready to go. I tried to be careful, but anyways. Honestly, I wasn't expecting the reapers to come up so fast. Soil temp is right around 80-85F, using the heating mat, "seedling dome", and the light. I've started the light on a 12 hour cycle, and will pop some house plants under it to get them some rays while we have the space. Outside "feels" like -30F, stay warm! 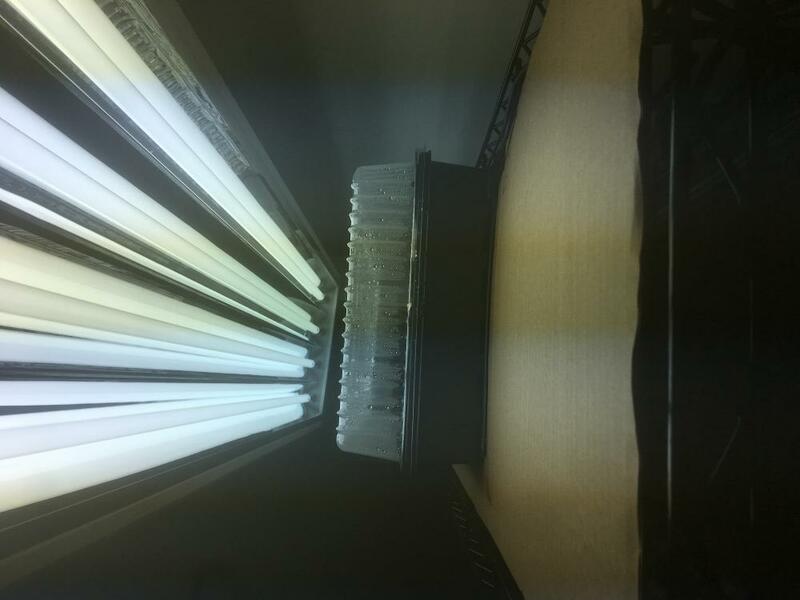 I raised the light fixture up about 2" since I was concerned about temps getting too high inside of the grow 'dome'. I am keeping the light on for 12 hours, then off for 12. Would you all suggest 14 hours? Anyways, it's on a timer, set for 7AM - 7PM. Our house's room temperature is anywhere from 65F-68F; I am finding that if I alternate the light/heat mat (12 hours light only, 12 hours mat only), I keep the soil temps around 80-86F. So, I think I may have found what works for me, right now. I'm happy to see that more of the seeds have started sprouting. The count is as follows: Reapers - 7, 7 Pot - 6 (these came out of nowhere), Scorpion - 1, Habs - 0. On an unrelated garden planning note, we're finalizing what we're planting in our plots. We learned a lot last year about what is/isn't practical for our situation and look to focus mostly on herbs and tomatoes. We help where we can with the guy who runs it, so we get garlic/onion/fruit/beans/beets/etc. from what he grows. It's a pretty amazing little place. (~2 acres maybe) My girlfriend grew a badass herb bed as well; pesto, pizza, and fresh pasta sauce all summer! Looking forward to another year of it, it's only a few months away from getting rolling. I noticed a bit of bleaching on one of my reaper seedlings, so I moved the light back a little bit. It's sitting at 11" from bulbs to the tops of the tallest seedlings. More 7 Pots have come up, another Scorpion, but still no Habs. I accidentally took off the 'head' of one of my seedlings. It wasn't shedding the seed shell and was the first to emerge. It was looking sickly, so I figured it might die anyways if I didn't try to get that thing off. Maybe I should have just let it go? Soil temps seem OK still. 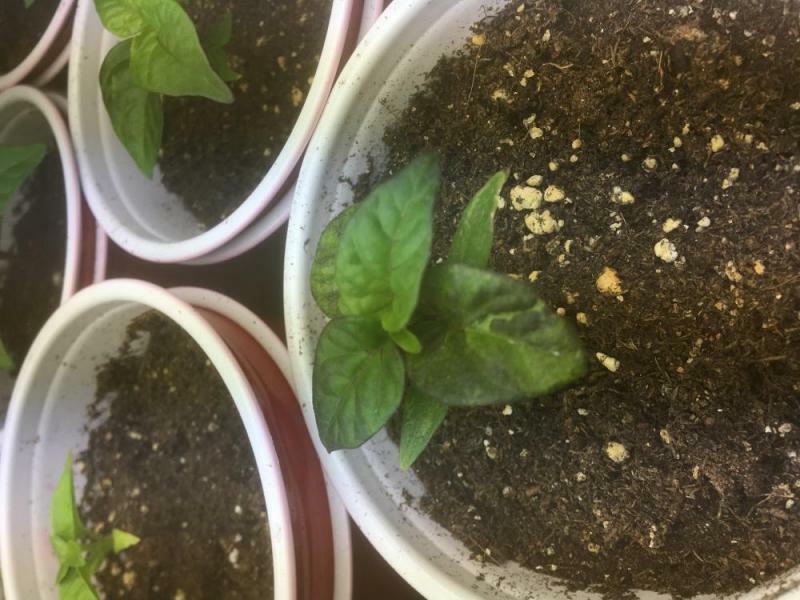 I put a few more pepper seeds into cups to start a few plants. I use Thai Ornamentals quite a bit for cooking, and enjoyed the short, bushy plants this past year. I popped some Cayenne seeds in as well AJDrew's bonus packets. (Trinidad Bean/another one whose name escapes me.) Better too many seedlings than not enough, right? 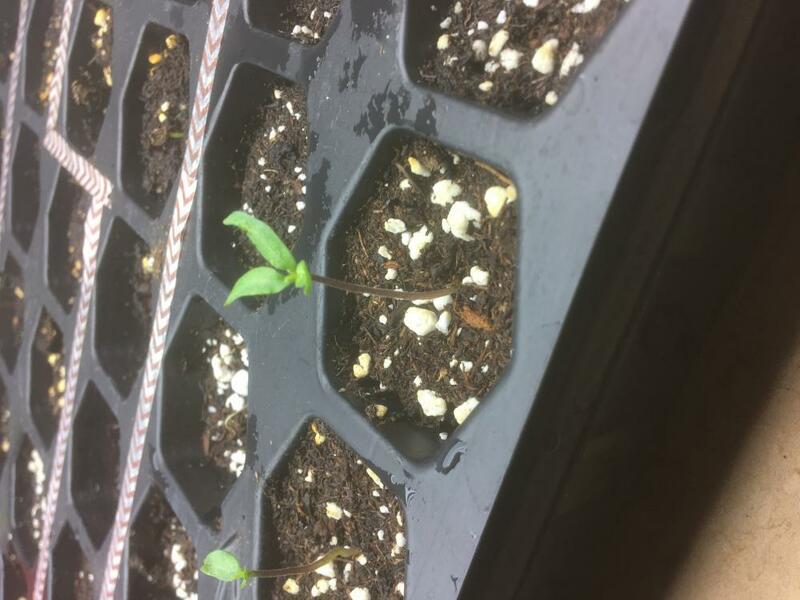 It's been 9 days (8 full days) since the seeds hit the soil. I'm really hoping the rest come up. Think the majority of the folks have the lights on at least 14H a day, but alot from what I have seen are 18-6 or 16-8 which is what I have mine at, only to conserve the electric bill abit more. It may be debatable whether to have the lights on to germinate...you can find many glogs where they stick them up in a warm (heat mats) dark place and crank on the lights once seedlings have started to come out of their shells. For me, most of my stuff germ'd in the dark and only had abit under the lights just cause I ran outta room on my mat. In the end just find whatever works for you. Hope you have a great year though man keep those updates coming eh!! that took 27 and 34 days! It looks like raising the light (lowering the tray) helped with the leaves. There's still a lot of seeds to come up, but I do have a good number of seedlings. Reapers and 7 Pot's are doing the best (7 and 13 respectively) and habs the worst. (None) Soil temps are in the high 70's to mid 80's. True leaves are coming in on some of the plants. Note: I've been watering too much, maybe. I was starting to have a little green 'slime/mold' growth in a few of the seedling cells. I took the humidity dome off for a few days and it's seemed to have gotten better. On the flip side, the tray dries out quickly. 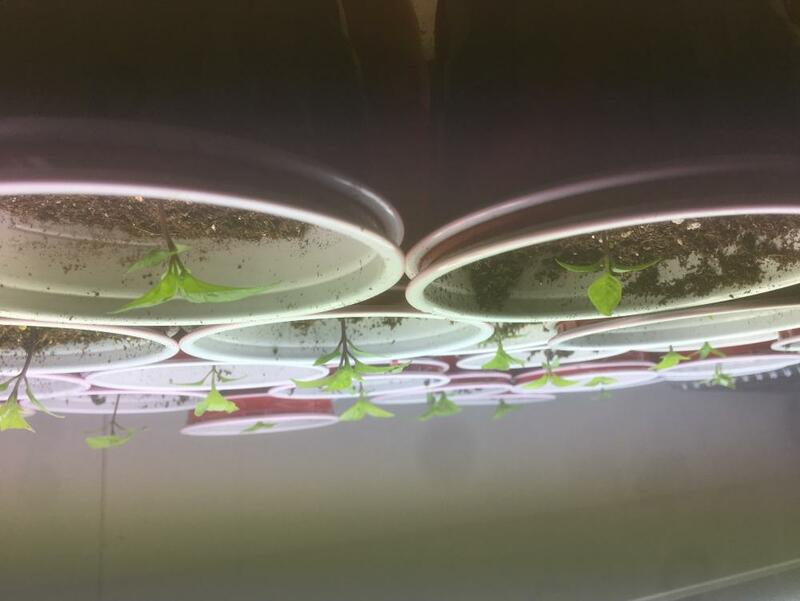 Some plants were a bit reachy (leaves pointed up to the light) but doing one of the following may have helped: raising the light (heat/light intensity? ), removing the humidity dome (heat), drying out a little (water). They're not all perfect looking seedlings but they are coming around. No activity from the Trinidad Bean/Cherry seeds I planted, as well as Thai/Cayenne. That would be very early though. edit: Thai's are coming up! Also, on an unrelated note, can you top tomato plants like pepper plants? Edited by ThePickler, 16 February 2019 - 06:28 PM. You can if it is one of the intermediate tomato varieties, so just make sure before you chop some heads off is all. A quick update, pics will happen this weekend. 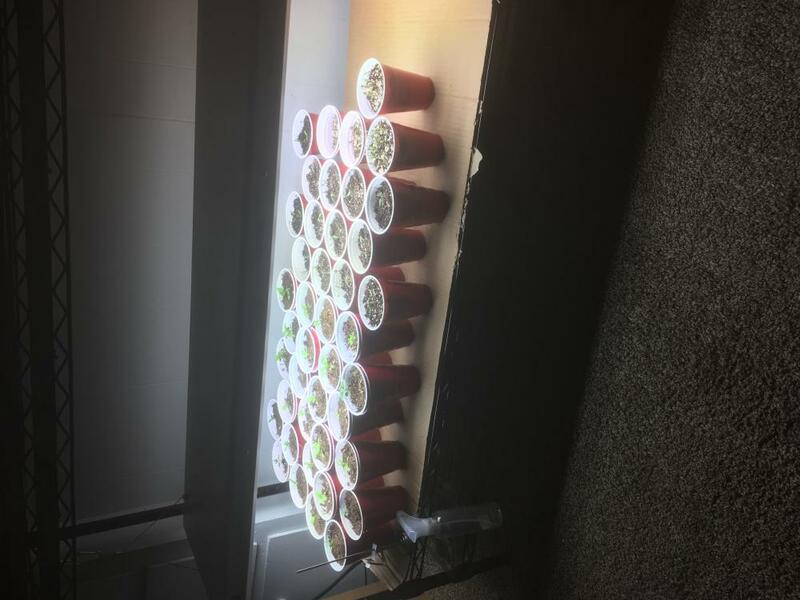 I've transferred my seedlings into solo cups. Most are about 2" tall with their true leaves being grown. 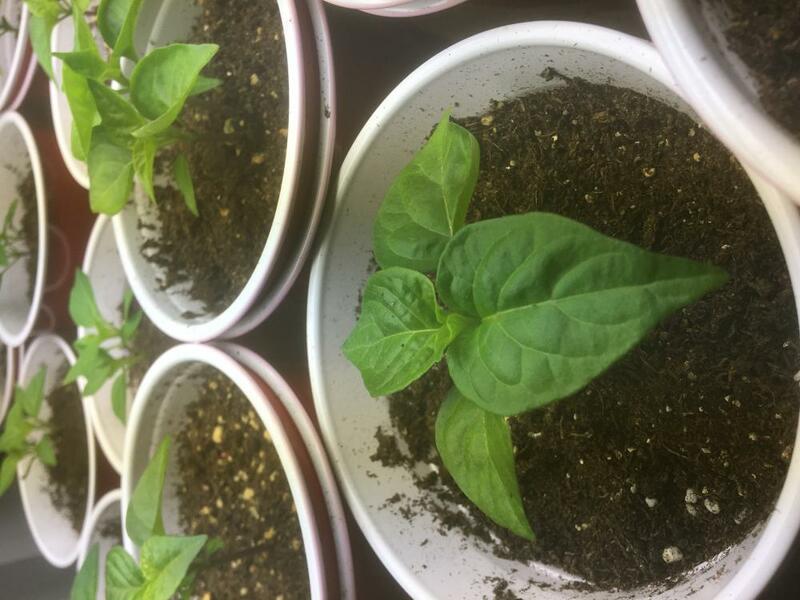 I've got 6 good looking Reapers, a bunch of 7 Pot's (also looking really good), 20ish Thai Ornamental (these took off like weeds...'re-potted' 12 of them. ), and still no Savinas. Here's my thought: I kept the seeds too wet. Many of them may have rotted away or who knows what. So, I put the humidity dome back on and am keeping them on the heating pad. I'll be cutting down on watering and hoping for the best. Keeping our fingers crossed! 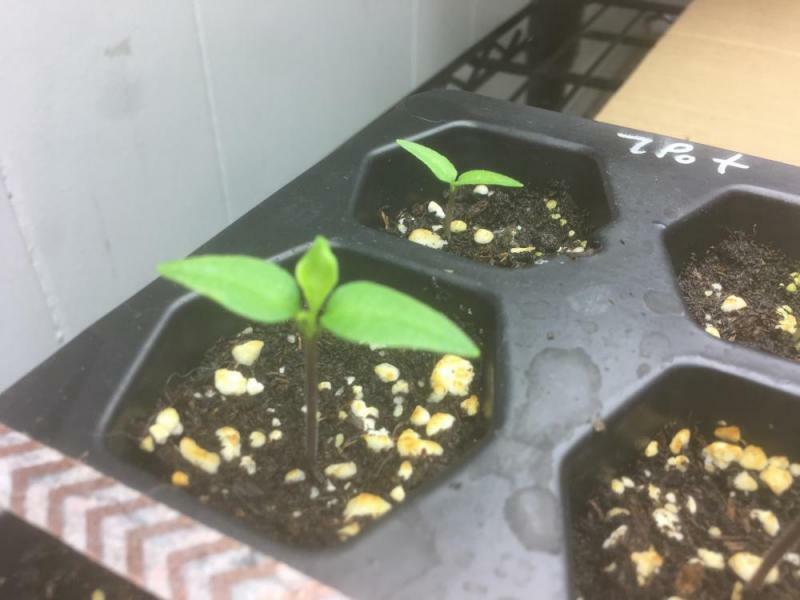 I have a few new things that are growing: Trinidad Bean, Jalapeno's are throwing out roots, some tomatoes (Black Krim, Amish Paste, Wisconsin 55's) are coming up. Last year we had a big crop of tomatoes but we started a lot of them late, so this year we're starting the seeds a month and a week earlier. I know it's pretty damn early but our season is short. Edited by ThePickler, 21 February 2019 - 11:28 PM. The peppers seem to be doing well. A lot are growing their second set of true leaves (or the set of leaves after the first set of true leaves). I put the Thai Ornamentals in their own solo cups and they seem to be taking off. Also, the super-hots seem to be doing good as well. There are a few plants with leaves that look a little damaged, I'm not sure why. Their growth doesn't seem to be affected. I ran out of regular seedling mix so I used more purpose made seed starting mix (both from Jiffy). Temps are down from 80-85F and humid under the starting-dome, to 70F and lightly breezy from a small house fan. I let the fan run while the light is on. Tomatoes are up...All of them. Yikes. My girlfriend said we'll probably need to get another light, which is cool because we're only using half the current rack system. Questions: If using a seedling/seed mix, is fertilizing needed? I need to read a bit more about what to add when, as I've heard about adding fertilizers when they grow their true leaves. Here are some pictures. I wound up with a few reaper plants that had three cotyledons instead of two. What's up with that? Note on the photos: I tried rotating and saving them in an image editor to try and get their orientation the right way but it won't go. Lights are now off so that's what I got. Edited by ThePickler, 23 February 2019 - 10:08 PM. From what I can tell, starts look good! Your seedling mix probably has no nutrients. couple of times and then up it to full strength. Your starts look like they are ready. I looked up the seed starting mix from Jiffy and it does indeed have no fertilizers in it. I'll swing to the store today and pick some up. Also, I've noticed some leaves on some plants are getting some purple tint to them. I've seen full grown plants with that on it but am curious if it's from light burn or just what the plants do. I'm also thinking about dropping the light down another few inches soon as well. I've cut back on watering, so the seedlings can dry out a little bit. Quick update: I've re-homed the Krim's into their own cups; the rack is about 3/4 full. It may be time to get the new light on order. Also, I picked up some more soil for our other starts and some guano fertilizer. I compared this to the fish fertilizer (5-1-1), and it is sort of close if diluted. (10-3-1) My girlfriend HATES the smell of the fish fertilizer (I think it's OK, it smelled like molasses to me when we used it this past summer.) so that's not an option. Anyone see any issue with this? I've mixed a tea full strength as directed and plan to dilute that 1:1 with water. On the upside there doesn't seem to be any aroma. Edited by ThePickler, 24 February 2019 - 07:24 PM. The purpling is just the plant's reaction to the light. Winter still has a hard hold on the area. We, like a lot of places, got DUMPED on. 0F this morning without the windchill and more to come! I wonder if we'll be getting a late spring? Anyways, I mixed up some guano tea two days ago (the evening of the 24th) at recommended strength. The box says that it would provide 10-3-1 NPK. Going by what I've read in the forums here, and knowing people love the 5-1-1 fish juice, I diluted the tea once in half, then again. I watered the peppers this morning and think that they have greened up a bit. Maybe I'm just thinking I'm seeing it. Lights are on 16 hours, off 8. Temps are in the low 70's and the fan is on them while the lights are on. They are standing quite strong (can't say the same for the tomatoes, they are still recovering from their move...) and looking quite healthy. I need another light... I'll upload new photos at the end of the week. Sounds like things are going well there, Pickler! trigger on that process, yet. It's snowing again, and supposed to get colder. The peppers seem to be doing fine. I'm going to hit them again with the diluted compost tea on monday. Weekly feedings should be OK, correct? (Weekly, weakly as one forum member put it. Can't remember their name.) Anyways, attached are some photos of the peppers. The seedlings are at the oldest, 3ish weeks old. How are they looking as far as growth is concerned? 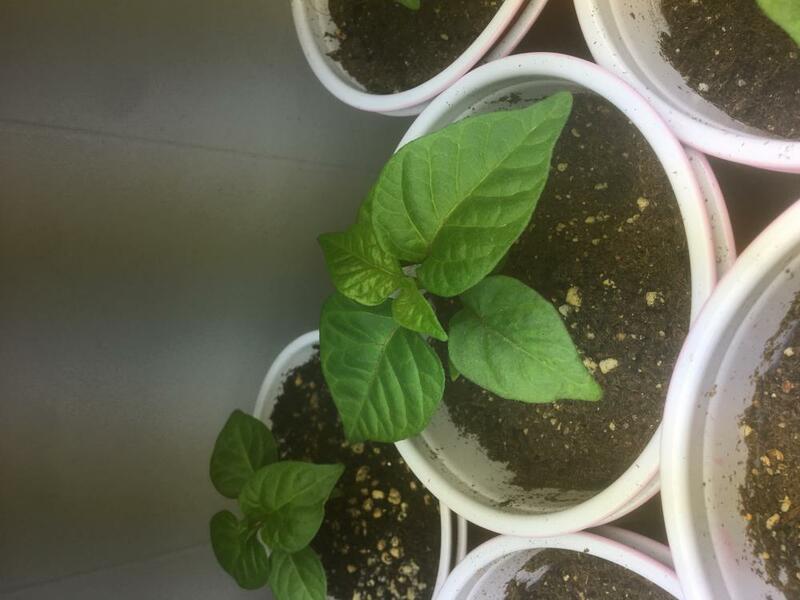 These are Reapers/7 Pots in the pictures. I have a single Butch T Scorpion that's really slow to grow, but coming along. Temps are still low 70's, light cycle is 16 on/8 off. Watering every 3ish days. 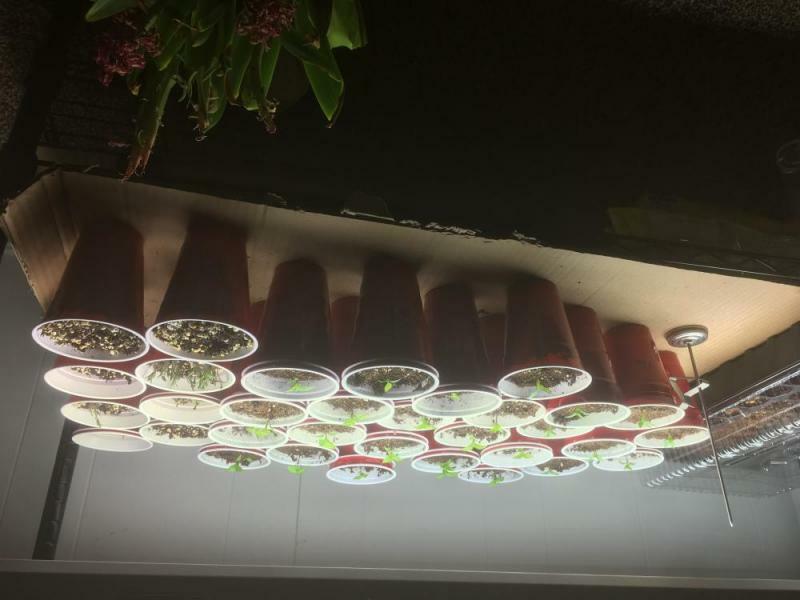 I'd like to move the light down but the tomatoes are still pretty new. 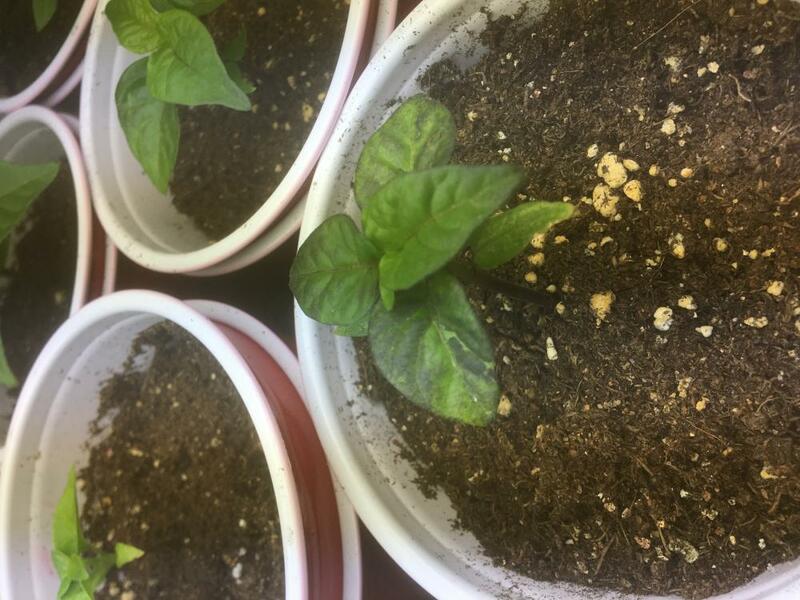 Roma's were re-homed to more solo cups, jalapenos and bells are coming up, new hab's have been started. I wonder to myself if I started this stuff a bit early, but remind myself that I'll be topping all of these. Edited by ThePickler, 02 March 2019 - 08:07 AM.